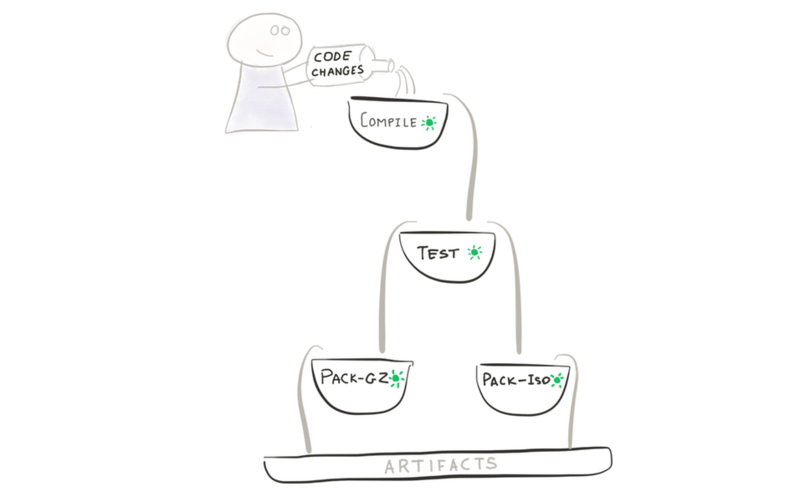 Let’s assume that you don’t know anything about what Continuous Integration is and why it’s needed. Or, you just forgot. Anyway, we’re starting from scratch here. If there’s no such phrase, the whole development team stays without a salary for a month. Yeah, it is that serious! The problem is that there are ten developers in the team, and, you know, human factors can hit hard. The build fails as expected! Okay, we now have automated tests here! GitLab CI will run our test script every time we push new code to the repository. The next business requirement is to package the code before sending it to our customers. Let’s automate that as well! Perfect! However, we have a problem to fix: the jobs are running in parallel, but we do not want to package our application if our tests fail. We have three sequential stages to compile, test, and package our application. We are passing the compiled app to the next stages so that there’s no need to run compilation twice (so it will run faster). We are storing a packaged version of our app in build artifacts for further usage. So far so good. However, it appears our builds are still slow. Let’s take a look at the logs. Wait, what is this? Ruby 2.1? Why do we need Ruby at all? Oh, GitLab.com uses Docker images to run our builds, and by default it uses the ruby:2.1 image. For sure, this image contains many packages we don’t need. After a minute of googling, we figure out that there’s an image called alpinewhich is an almost blank Linux image. It looks like there’s a lot of public images around. So we can just grab one for our technology stack. It makes sense to specify an image which contains no extra software because it minimizes download time. Note that job names shouldn’t necessarily be the same. In fact if they were the same, it wouldn’t be possible to make the jobs run in parallel inside the same stage. Hence, think of same names of jobs & stages as coincidence. The problem is that mkisofs is not included in the alpine image, so we need to install it first. 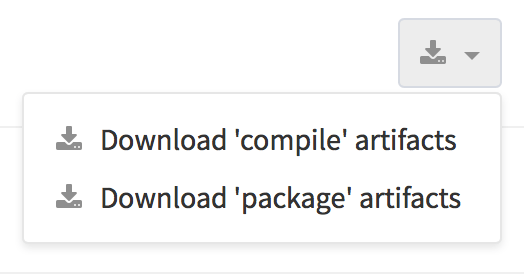 However, to make it semantically correct, let’s put commands related to package installation in before_script. Note that if you usebefore_script at the top level of a configuration, then the commands will run before all jobs. In our case, we just want it to run before one specific job. To delegate some work to GitLab CI you should define one or more jobs in .gitlab-ci.yml. Jobs should have names and it’s your responsibility to come up with good ones. Every job contains a set of rules & instructions for GitLab CI, defined by special keywords. Jobs can run sequentially, in parallel, or you can define a custom pipeline. You can pass files between jobs and store them in build artifacts so that they can be downloaded from the interface. Below is the last section containing a more formal description of terms and keywords we used, as well as links to the detailed description of GitLab CI functionality.